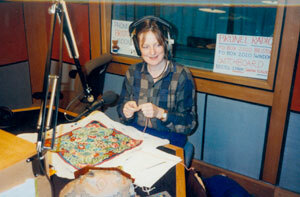 I used to have a slot on Sundays on Brunel Radio in Bristol, talking about painting & answering calls. 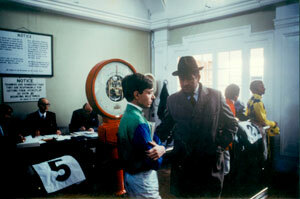 Talking to the jockey Lester Piggott at Newmarket in 1984. 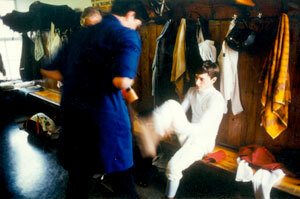 In the weighing-in room: Steve Cauthen who became Champion Jockey. We knew him well when he lived in England before he went back to Kentucky and retired. He now breeds race horses. A helping hand putting on his boots which are like gloves. Steve, like all jockeys, was permanently half-starved. He could never indulge or drink or stay out late and was well below his natural weight. 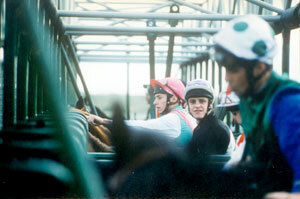 This becomes a real strain after a while and is one reason why jockeys often retire early. Kim walking down to the beach in Cornwall, near Fowey. 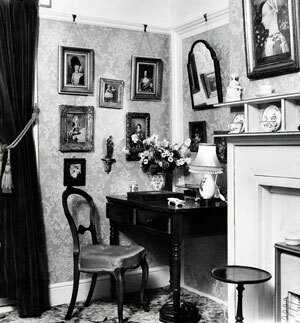 We used to stay in a dear old house called Whitewalls in Fowey, which belonged to our friends Richard and Judith Bond. 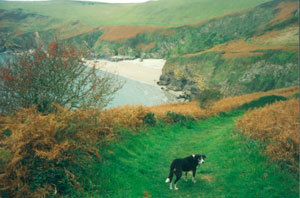 Kim always tried to herd the waves, being part Welsh Collie and having the sheep herding instinct. She barked at them until she went hoarse and ran up and down the length of the surf until she was exhausted. Sometimes we came across a very old, very suntanned man bathing from the rocks. 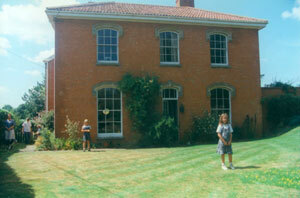 This is our house in Somerset, soon after we moved in. 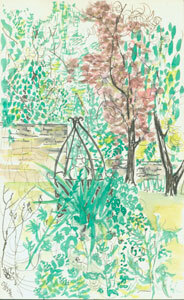 This is a painting I did of the well in our garden in Heronsgate. Burton Dassett, Warwickshire. 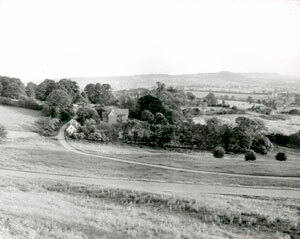 We lived in the cottage on the right of the lane, in the grounds of the Old Rectory for a few years. Robert took this photo. 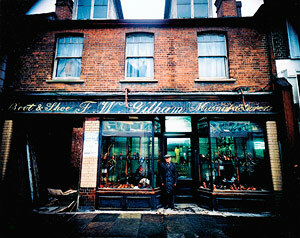 F.W.Gilham's Shoe Shop was where we went to get school shoes in Rickmansworth. 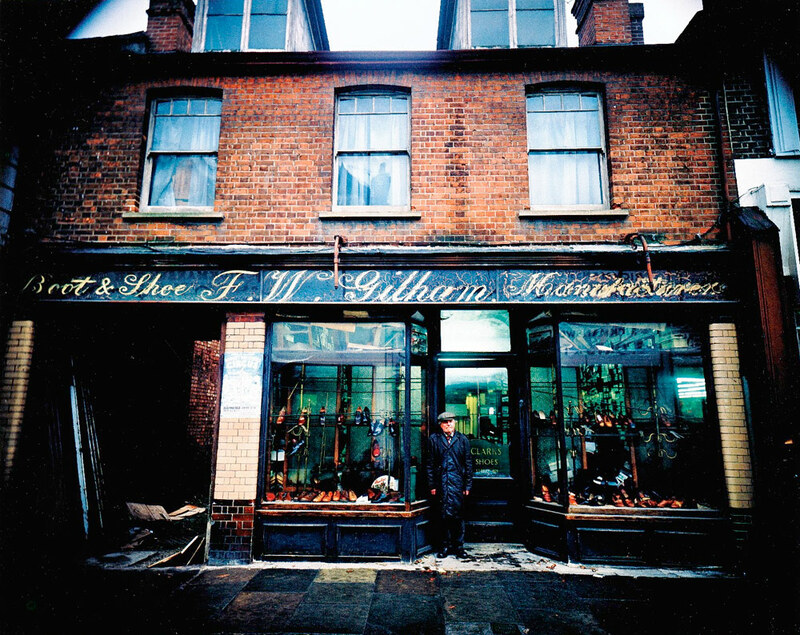 I didn't know that it was the oldest shoe shop in the country (started trading in 1860) until I saw this wonderful book. 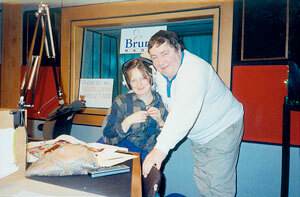 In my day it was run by brothers Frank and Bazil, who both seemed old and grumpy to me. They wore worn but once grand pin-striped suits with knitted pullovers underneath. It was very cold and one of the men had a dewdrop on the end of his nose. The shop was uninviting and piled to the ceiling with white and grey shoe boxes with the shoe description and size at one end. "Mr Gilham" would measure our feet with a sliding foot-shaped measure and then go to the pile which was the preferred style. He could remove a shoe box with a stick from high up without causing the pile to collapse and would catch it as it fell. The shoes were nearly always Start-Rite, brown leather, ugly and round toed. We were not allowed to see any except "suitable shoes". In 1988 'Thomas Cook' bought the shop after it had lain empty for two years. By this time it was draped in cobwebs and looked like a film set. F.A. Bone, Hay, Straw, Corn & Seed Merchant was in Rickmansworth High Street. My mother went there to get things for her horse, for my canary, for the dog.... it was also a hardware store. 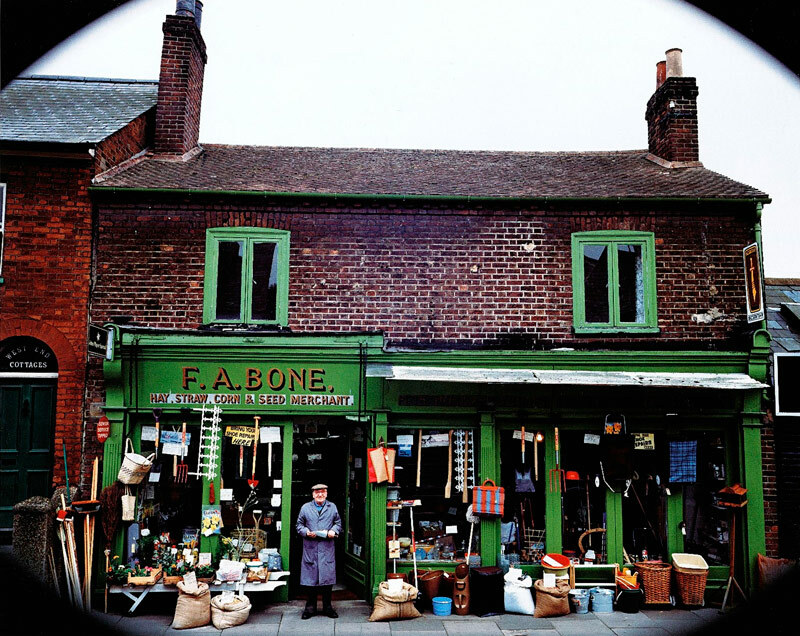 The particular green of the paintwork is a green you don't see anymore and could be described as Nasturtium Leaf..... there were always sacks of sweet smelling things outside, bran, maize, oats, wheat and seeds or dried beans. Feed for horses, hens and guinea pigs. After Gilham's closed F.A. 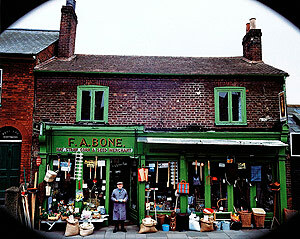 Bone became the oldest shop in Rickmansworth, trading since 1875. 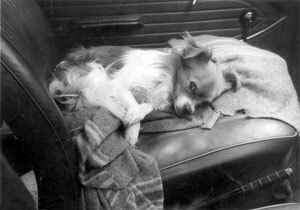 In the early 1980's I worked one day a week for Feliks. 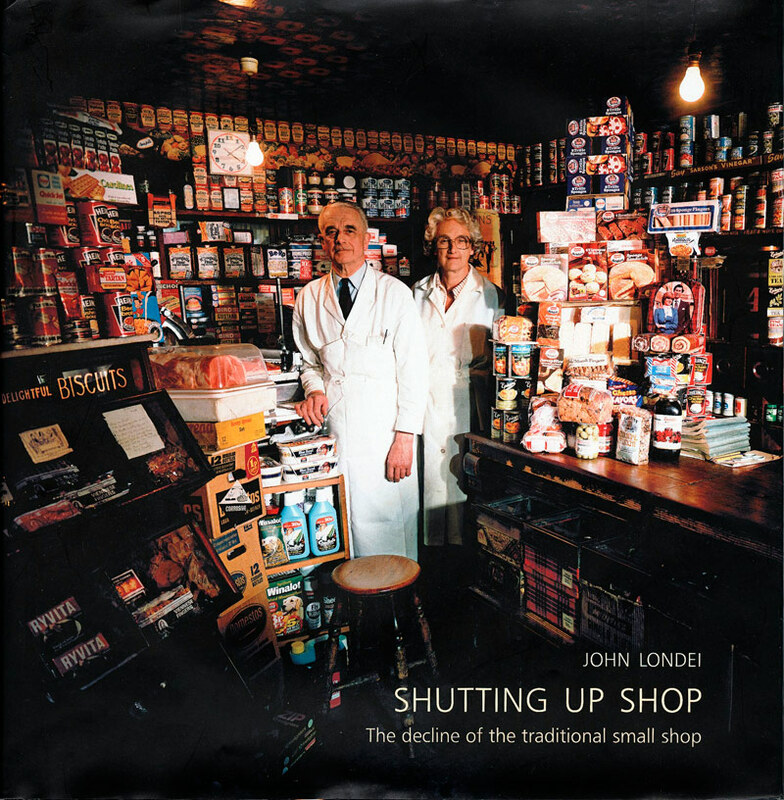 In his huge studio underneath the railway arches at Waterloo's South Bank. 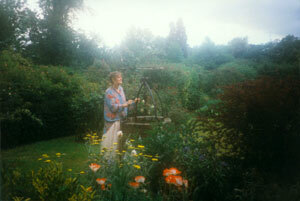 I did everything from typing letters on an ancient type-writer (no such thing as laptops then), sorting out his bills and accounts, to shopping in The Cut, going to the market and collecting his laundry. 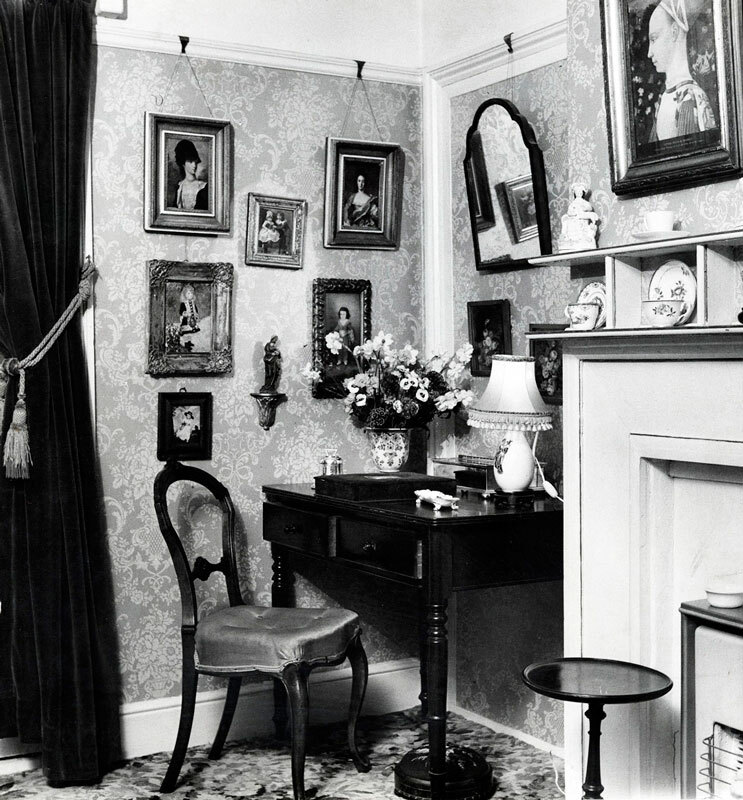 The studio was damp, dark and cavernous, draped in his vast paintings MEMOIRS OF A CENTURY which hung like neglected and ancient flags all round the place. He was small and nimble and his paintings were vast and chaotic. 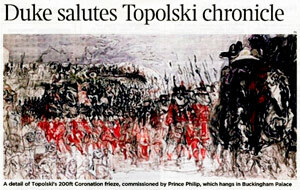 Visitors to the studio would find themselves captured in paint and ink and captivated by the charisma of Topolski. 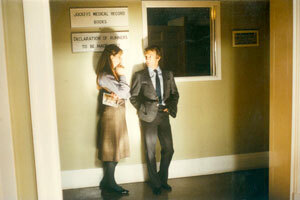 He adored women and adored his wife, Carol. Feliks was like a centaur in cowboy boots. When I had my first exhibition of my paintings at the Langton Gallery in Chelsea Feliks came on the wrong evening for the private View and the gallery was closed. He left me a generously admiring note. His studio is open to the public on Fridays from 5 p.m.